In politics, we hear a lot about groups that back one party or one candidate. Unions for Democrats, business groups for Republicans. But in Sacramento, political giving from some special interests isn’t that special at all: Many big groups flex their political muscle by simply hedging their bets, spreading money around to both parties -- and in some cases, even both candidates in the same race. The reason, say political experts, is the desire to ensure access, plain and simple. KQED News picked four groups that represent a range of interests: telecommunications giant AT&T, the California Association of Realtors, the Pechanga Band of Luiseño Indians, and utility behemoth Pacific Gas & Electric Co.
An analysis of recent political giving showed that these entities -- which have given sitting lawmakers a combined $3.2 million since 2012 -- spread their money nearly evenly among Democrats and Republicans, and in many cases gave to both candidates in some of the Legislature’s most contested races. How Many Legislators Accepted Money From these Groups? View in a sortable database. AT&T gave money to nearly every sitting lawmaker in his or her last election; only four senators and three Assembly members missed out on a contribution from the telecommunications company. AT&T also played both sides of the same contest in some cases, handing out money to competing candidates in a total of 10 Assembly or Senate races. The other groups in this analysis weren’t far behind, generally giving money to between 80 and 90 percent of incumbent lawmakers (the one outlier was PG&E, which gave to only 60 percent of current senators, but 86 percent of Assembly members). In all, AT&T directly contributed more than $570,000 to candidates and another $900,000 to the state Democratic and Republican parties between 2012 and 2014. Those amounts don’t include campaign giving by AT&T executives or its other employees. Company officials did not respond to requests for comment. And AT&T is still making its careful bets. Last week, the company gave the maximum allowable to both Susan Bonilla and Steve Glazer in the East Bay’s bitter Democrat-versus-Democrat special election for the state Senate. Last month, it cut both a $65,000 check to the California Democratic Party and a $25,000 check to the California Republican Party. State campaign finance limits to political parties are set at $32,500 per election cycle, while candidates for the Legislature can take only $4,200 from an individual or business. The parties can, in turn, donate unlimited sums to candidates. The political giving included in KQED News’ analysis accounts for only a fraction of the money that groups like these spend trying to influence decision-makers in the state Capitol each year: Over the same two-year period, AT&T spent nearly $4 million on lobbying efforts in Sacramento; PG&E spent $3.7 million; the Pechanga Band shelled out more than $700,000; and the Realtors spent $2.4 million. Those figures include gifts to state officials. 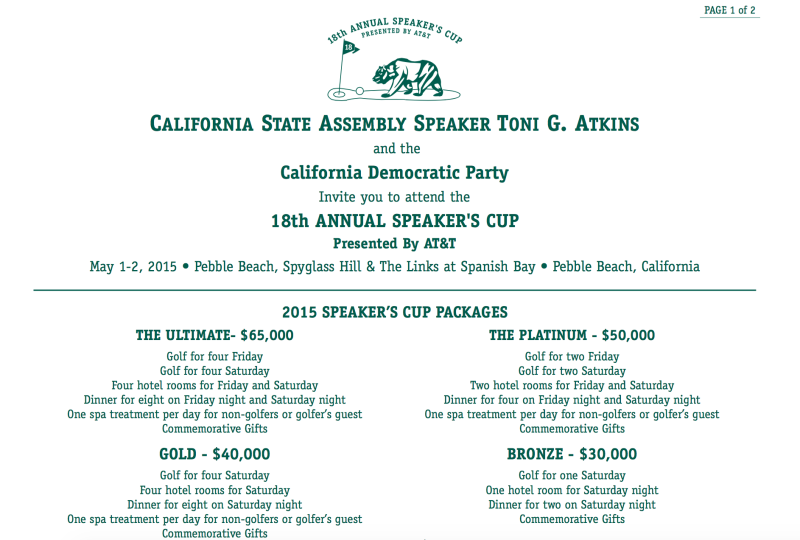 AT&T also spends hundreds of thousands of dollars every year hosting the Speaker’s Cup at Pebble Beach, a fundraiser for Assembly Democrats that was held earlier this month. Campaign finance reports from that event haven’t been filed yet. The four groups also gave a combined $112,200 to Gov. Jerry Brown in the last election. 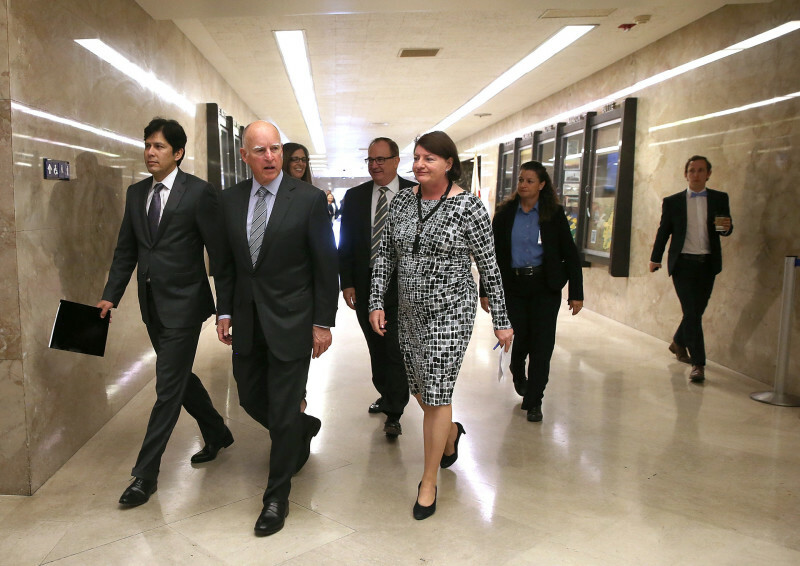 PG&E gave the most to the governor’s campaign, $54,200 -- just under the maximum allowed by law. Only Mark Macarro, chairman of the Pechanga Band in Riverside County, responded to a request for comment. In a written statement, he said that the tribe’s goal in making campaign contributions is to protect “historic tribal rights so that tribes can survive another generation." “History has demonstrated that avoiding political participation results in catastrophic policies against Native people and our inherent tribal rights. Native American rights and issues are highly diverse and truly nonpartisan. Our issues stretch from gaming policy, to Indian child welfare, to sacred sites protection,” he stated. But why would the tribe give to two legislative candidates running against one another, as in 2014 in both the state’s 28th Senate District (Republican Jeff Stone and Republican Bonnie Garcia) and the 34th Senate District (Republican Janet Nguyen and Democrat Jose Solorio)? While MapLight’s Newman said it may not make sense to the average voter for someone to make donations to both sides in a race, companies and other influential groups have different considerations. Newman said it’s bad because the Legislature ends up being “overly responsive” to these big givers. But Jason McDaniel, a political science professor at San Francisco State University, said the simple act of giving or taking money isn’t corrupting. “The assumption that money buys politics, buys elections is mostly incorrect and I think it’s corrosive to our trust in democracy,” he said, adding that campaign finance is “highly regulated and highly transparent” in California. He agreed with Newman, though, that groups hedging their bets are angling for a seat at the table. But McDaniel argues that lawmakers still have a vested interest in generally voting the way in which their constituents expect. “I think (these groups) recognize their interests are fundamentally at stake in the governmental policy process," he said, "and want to make sure they are on good terms with whoever might be influential in the policy process." Besides pure spending power, McDaniel said, groups such as Indian tribes and big business groups have another advantage over citizens: Their interests are narrow, allowing them to to focus their influence in a way individual constituents generally can't. KQED News examined campaign finance reports from each Assembly member and senator’s last election committee and the contribution reports filed by the outside organizations. Not included are any contributions made by an employee PAC, or individuals employed by these four organizations. KQED News producers Guy Marzorati and Lisa Pickoff-White contributed to this report.